We’d love your help. 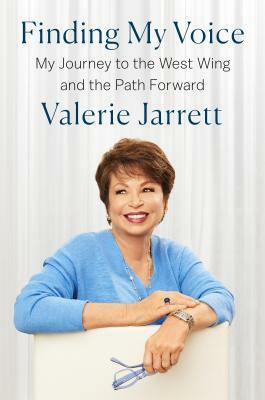 Let us know what’s wrong with this preview of Finding My Voice by Valerie Jarrett. To ask other readers questions about Finding My Voice, please sign up. Loved Ms. Jarrett's 4/2/19 interview on The View...Has anyone read this? 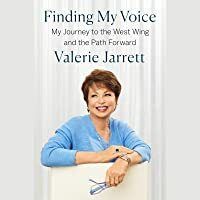 In Finding My Voice, Valerie Jarrett discusses her upbringing, her early career in government, and her friendship with the future First Family. Overall, it was a pretty quick read that provided an interesting perspective of the Obama Administration, to include some challenges and successes. I appreciate that Ms. Jarrett acknowledged early in the book that much and more has to do with luck, as some senior government officials make it sound like they were de I won this book as a Goodreads Giveaway. I received an ARC of this book and leave my thoughts below. This is a rather interesting biography of a figure that I thought I knew a fair amount of from following the Obama presidency, but was pleasantly surprised to find some fascinating perspectives that really help make this particular biography a welcome read. Her own personal biography is one that should prove to be an inspiration for those struggling to find a place in life. Easy to pick up and fascinating to go through, well worth a pick I received an ARC of this book and leave my thoughts below. I got an ARC in a Goodreads giveaway. Finding My Voice is part autobiography and part political memoir. It is an easy and quick read mostly due to the lack of details. Do not expect any "juicy" details/stories in this book or new insights into how the Obama family/administration functioned. I am sure this book is inspirational to those who are black and/or women but otherwise, it is just like most other Obama staff memoirs in that you will take away few lessons and is self-serving. I thoroughly enjoyed this book. Ms. Jarrett describes working the Oval Office and White House in a very vivid way, so you get a better understanding of the physical surroundings as well as the personalities of those on the staff. She is a great write and very inspiring in her own personal accomplishments. She and Pres Obama had a unique friendship. Reading about those working days, brought me so much joy! Excellent read! Valerie Jarrett tells a wonderful story. I admire her. It was a delight to read--so informative--I hated for it to end. Three cheers Mrs. Jarrett! You are so blessed. Well worth my time. I gave it to myself as a birthday present. I'm glad I did. Such an insightful read. Inspiring. A wonderful read. It was really nice to gain a new perspective about the White House. I love Valerie Jarrett, I have a lot of respect for her. A beautiful book, I highly recommend it.